Send Your Child a Special Birthday Gift! Salute To Jewish Womanhood "93 Queen"
Our vision for the Chabad House is of a modern, vibrant student center that offers a compelling, rich and meaningful Jewish experience to all who come in contact with it. The values that lie at the heart of The Chabad House at Binghamton are embodied in Torah and Jewish tradition. 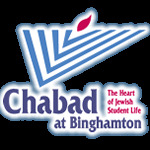 The Chabad Center at Binghamton is based on the ideology of Chabad and fueled by the inspiration and teachings of the Lubavitcher Rebbe, Rabbi Menachem M. Schneerson of righteous memory, which have at their foundation the encompassing mitzvah “to love every Jew as one loves himself” and the mandate to concretize that love with Acts of Kindness and Mitzvahs. It's our belief that every individual Jew has an indispensable contribution to make to the totality of the Jewish people. Chabad welcomes all Jews at their own pace and comfort level through innovative educational programs in all areas of Jewish life.